In the previous chapter, we saw how we can enhance collaboration by integrating it with Office services such as Teams, Streams, Yammer, and others. This is collaboration at its best because it’s seamless. You can access the platforms with one sign-in, i.e. the Office 365 SIGNIN mechanism, and discover a unique seamless experience. 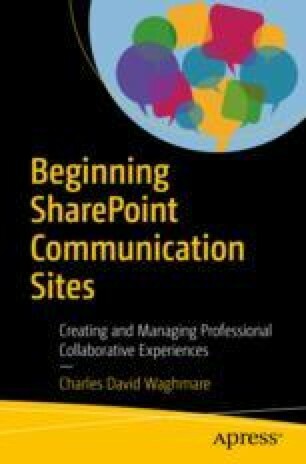 In this chapter, we are going to learn how SharePoint communication sites are used manage multiple communities in order to create a collaborative experience and build a community of practice.